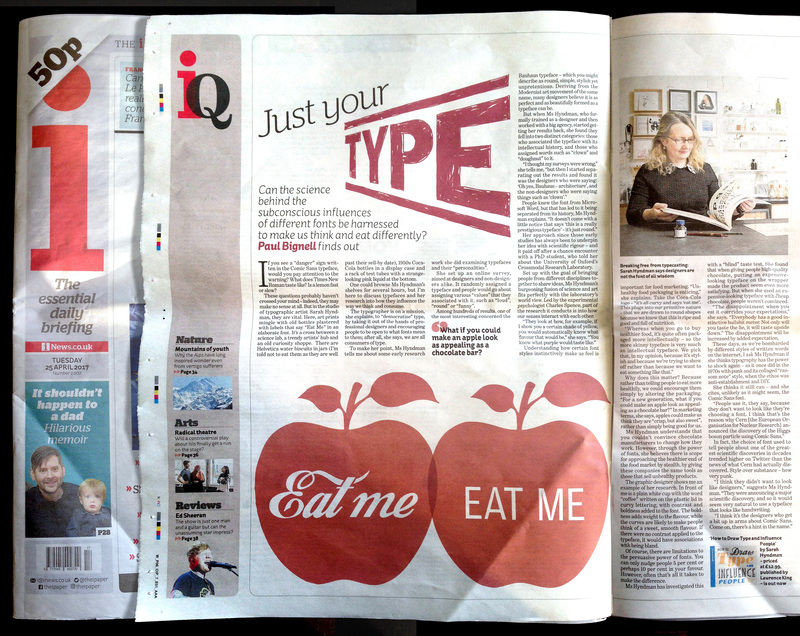 What is a typographic intervention? What if it’s not what it says on the tin? Can typography alter your experiences, or nudge you to change your behaviour? This year we are exploring the potential for creating typographic interventions that initiate positive behaviour change. 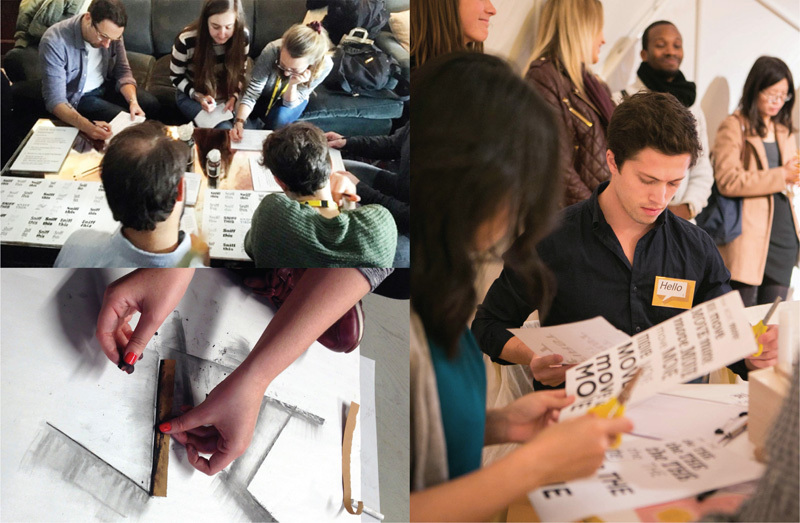 You are invited to take part in typographic research. Some of the experiments you will take part in are in their early proof of concept stages, for others data is being gathered potentially to be published as a future collaborative study. 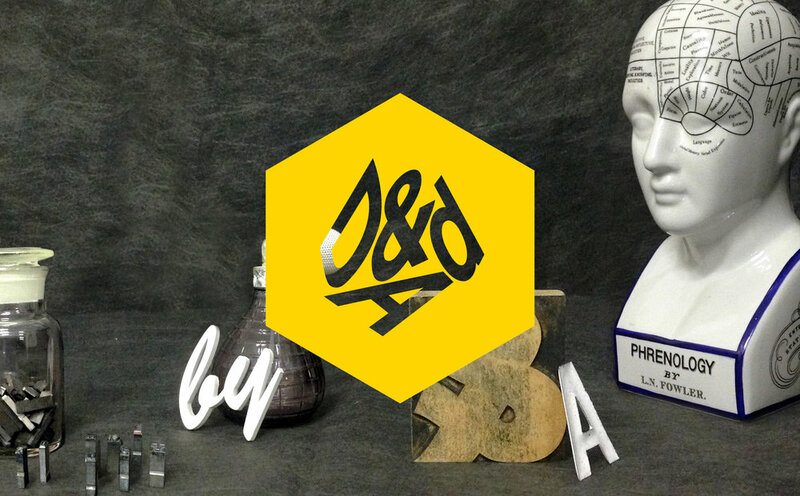 The Type Tasting Pop-up Typography Lab will be in residence at the D&AD Festival with a series of experiments running throughout the festival designed to gather data, and also to encourage you to think differently about typefaces and perception as you take part in them. Find out more here. Sarah will be speaking at about the results of this ongoing project at the Museum of Brands on 25th October. This is intended as a conversation starter about the language of enticement vs the voice of authority or guilt, with a view to publishing the results later in the year. The first stages of the explorations have been featured in The Times and iNewspaper. This is the third and final instalment reviewing Type Tasting in 2017: judging, the Type Tasting pop-up lab, publications and interviews. Type Tasting founder Sarah Hyndman has continued her mission to make typography relevant and engaging beyond the world of design, and continues to work on proof-of-concept ideas to show that design can create positive change. She has judged design awards, the Type Tasting pop-up lab has continued to gather data, both her latest book and a new collaborative study have been published and she has appeared in interviews from The Times to Channel 4’s Sunday Brunch. Sarah has been involved with the D&AD for a number of years; as a judge for their professional and student design awards, and as a bespoke typography course lead. She continues to work with students and was delighted to be invited to judge the Penguin student book cover awards this year. Sarah has been researching perception of typefaces and multisensory typography for four years, both online and at events. The Type Tasting pop-up lab has appeared at a number of events this year to gather data both for scientific studies and a future book that Sarah will begin writing next year. Thank you to everybody who has taken part. The second of Sarah’s books were published this year, with a well-attended launch event at the Tate Modern and an appearance on Channel 4’s Sunday Brunch as their typography expert. 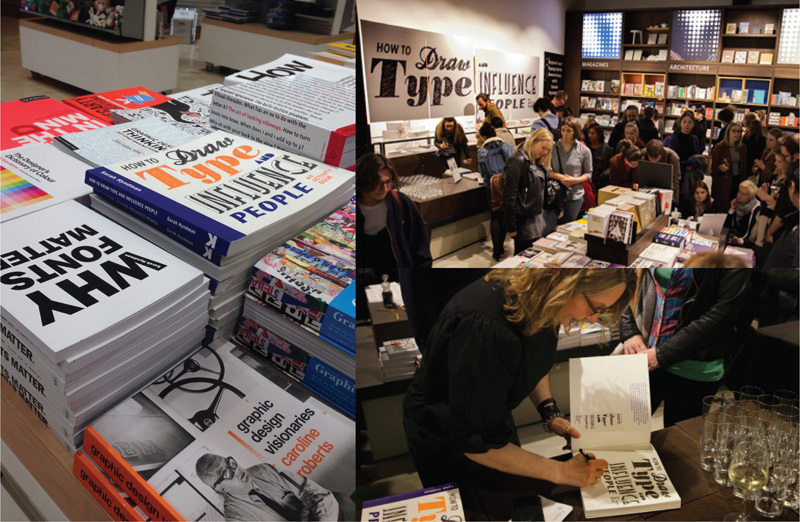 ‘How to Draw Type & Influence People: An Activity Book’ by Sarah Hyndman, Laurence King Publishing. D&AD illustration award entry. The latest collaborative study with Professor Charles Spence of the Crossmodal Research Laboratory at the University of Oxford has also been accepted for publication, this is the first to use data gathered by the pop-up lab earlier in the year. 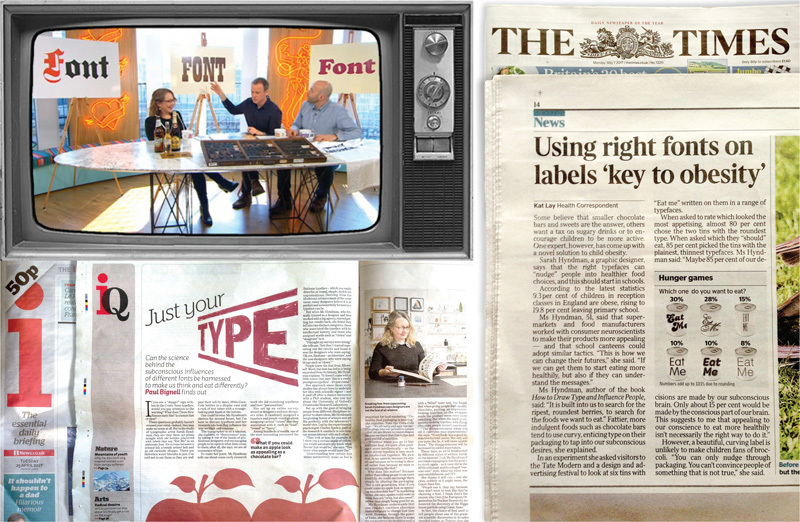 ‘The role of typeface curvilinearity on taste expectations and perception’ by Carlos Velasco, Sarah Hyndman (Type Tasting) & Professor Charles Spence (Department of Experimental Psychology, University Oxford), 2018, International Journal of Gastronomy and Food Science. A selection of interviews from live television to ones printed in real, inky newspapers. Would you like to commission a talk, workshop or event? This is the second instalment reviewing Type Tasting in 2017: corporate workshops, sponsored workshops and drop-in events (read part 3 here). 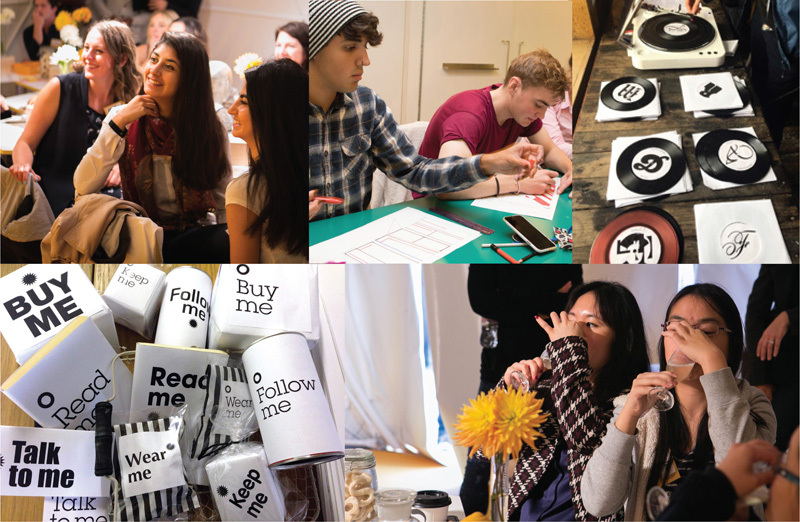 This year Type Tasting founder Sarah Hyndman has created workshops and events for a range of dynamic and innovative clients. Workshops have taken place at adidas HQ in Germany, for Design Thinkers in Toronto and at Tate Modern. 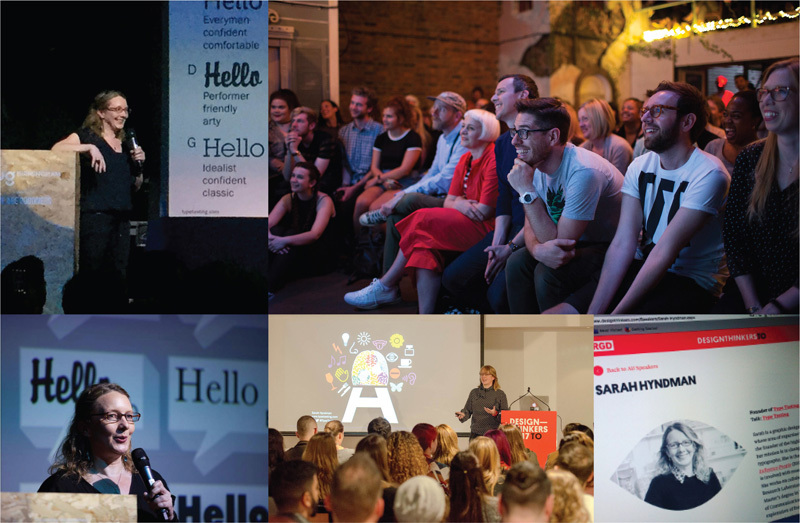 Sessions have been created to launch the new BumbleBizz app with a workshop for entrepreneurs, as a teambuilding ‘Fight Club’ evening at WGSN, at the Wellcome Collection and for the D&AD. Sarah teaches entrepreneurs how to use fonts to communicate their brand and how to create their own visual voice on social media. She also creates masterclasses, break-out sessions and pre/post talk activities. Participants are guided through the layers of an experience that will inform, entertain, and engage their curiosity. Preconceptions and assumptions are questioned and activities are created to tell the story of a brand or product experience. Photos by Benjamin Glean (corporate workshops and sponsored sessions); Graham Sturt (corporate workshops); David Owens (sponsored sessions). This is the first instalment of a review of 2017—a busy and exciting year in which Type Tasting has popped up in prestigious locations both in the UK and abroad (read part 2 here). Type Tasting founder Sarah Hyndman is on a mission to make typography relevant and engaging for all, she also believes that design can create positive change. Sarah specialises in making a complex topic accessible with originality, humour, a dash of theatre and lashings of audience participation. This year she has spoken at the launch of a new watch, a fragrance conference, she has been interviewed by The Times and on Channel 4’s Sunday Brunch. She has created an immersive exhibition for the British Academy, and run workshops for adidas, BumbleBizz, Wellcome and WGSN. The Type Tasting pop-up lab also gathered data for the latest collaborative study with the team from the University of Oxford, and her latest book was published. Sarah’s interactive talks are packed with games and demonstrations that inform, entertain and challenge preconceptions. She has been a guest speaker at events such as the recent Mondaine watch press launch, the Fragrance Forum conference, and has spoken in Canada, Denmark, and India. Sarah collaborates with exciting and innovative people such as Tasha Marks of AVM Curiosities, as well as perfumers, composers, chefs and scientists. Together they create interactive exhibitions and experiential events that take participants on a multisensory journey, immersing them in typography and culture. 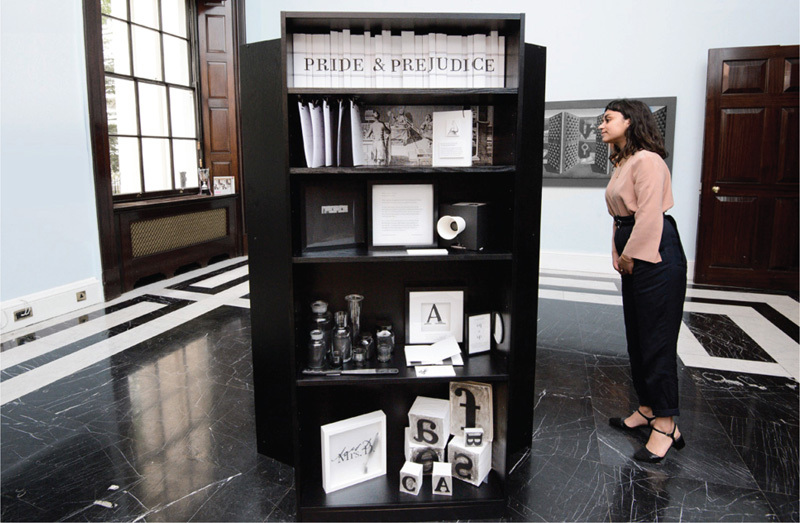 British Academy ‘Pride, Prejudice & Perceptions’; an interactive exhibition and Lates event held in May. This is an interactive sensory exploration of Jane Austen’s Pride & Prejudice, created by AVM Curiosities & Type Tasting for the British Academy’s Literature Week. Taking inspiration from the typography found in three editions of this classic novel, Pride, Prejudice & Perceptions uses type, sound, sight and scent to serve one story three ways. Photos by Jonathan Cherry (main public speaking photo taken at Glug Birmingham); Pride, Prejudice & Perceptions by the British Academy. Come along to the Type Tasting workshop at the Victoria and Albert Museum where you can pick a typeface that reflects your personality and customise it to create your own ‘Font Selfie’. Your design will be added to the display in this prestigious museum, which will grow throughout the weekend as we create an exciting collection of typographic self-portraits. You can showcase your work and follow the growing collection online at #FontSelfie. You are welcome to collect your work between 5pm and 5.30pm on Sunday. 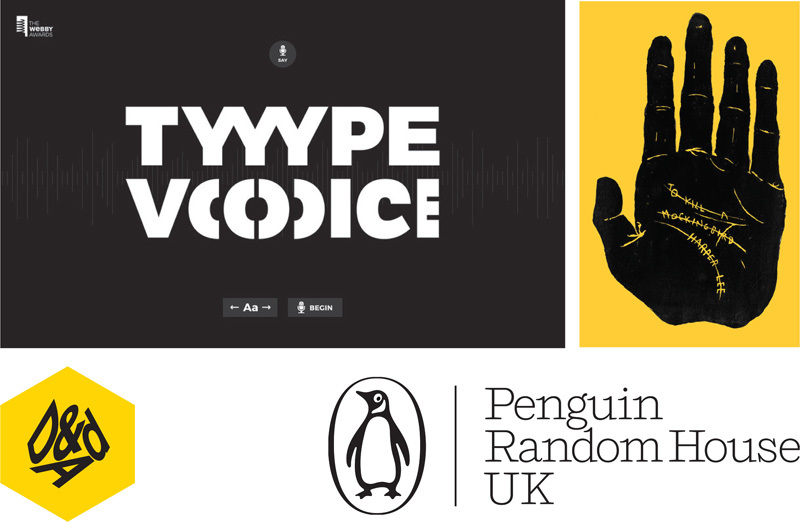 Author and Type Tasting founder Sarah Hyndman will give a short talk on telling stories with fonts. She will also be signing copies of her books. Hyndman has created this mass participation experiment as part of her ongoing research, which will form the basis for her next book. She needs your help: either come along to the Type Tasting Pop Up Laboratory at the V&A, or click here to take part online. “If you see a “danger” sign written in the Comic Sans typeface, would you pay attention to the warning? What does Times New Roman taste like? Is a lemon fast or slow?” Paul Bignell for i Newspaper. “Some believe that smaller chocolate bars and sweets are the answer, others want a tax on sugary drinks or to encourage children to be more active. One expert, however, has come up with a novel solution to child obesity. 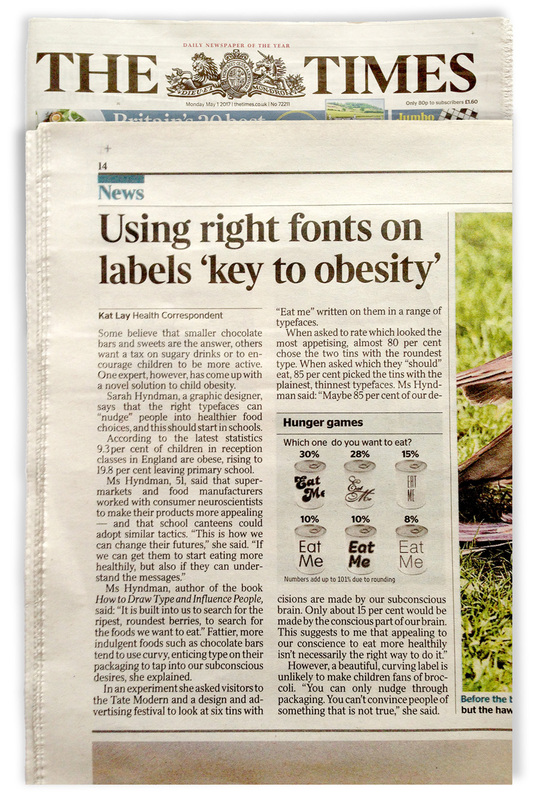 The article references the food can experiment that ran at the recent book launch at Tate Modern, and at the Type Tasting event at Shoreditch House for the D&AD Fringe Festival, were you there?